As the start of this school year turns to go time for a lot of us, I would just like to say that I am humbled and honored to be your SANDCASP president this year! 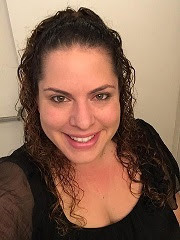 THANK YOU to our members and partners for your continual support in allowing SANDCASP to provide professional development and social opportunities to not only local school psychologists but also other education professionals across the county (and even across state lines). SANDCASP has grown exponentially within the last 2-3 years and we could not have done it without your sponsorship! In other news, the SANDCASP Events & Awards committee is currently planningour beginning of the year Kick-off Party. Date, time, and location will be announced within the next couple of weeks. So, stay tuned! Additionally, you may have noticed that our website and Facebook Group have a new look and updated logo. We have also recently launched a SANDCASP Instagram page. Feel free to browse the new website (and Instagram) when you get a chance. We are excited to announce that we will be offering SANDCASP merchandise for purchase very soon! Lastly, if you have not already heard, CASP Fall Convention is IN SAN DIEGO this year, November 8-10! The theme is “Investing In You = Investing In Students!” Register before October 4th to take advantage of early registration pricing and remember to join SANDCASP for our annual Underground Party at the CASP Fall Convention (ask a SANDCASP Board Member for more details)! Thank you all, once again, and see you soon! 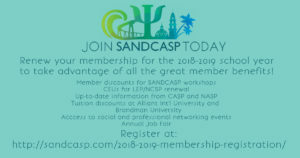 ← Save these SANDCASP Workshop dates!